Bury's squad "deserve credit" for their impressive run in League One following their promotion last season, says manager David Flitcroft. 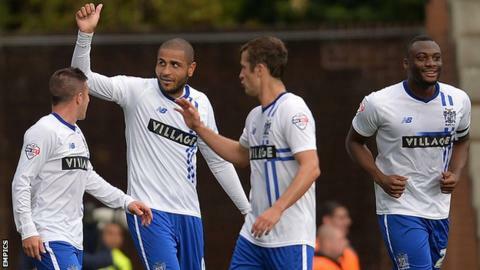 Striker Leon Clarke scored twice as the Shakers beat Coventry 2-1 at Gigg Lane for a fourth consecutive league win. Flitcroft, 41, led Bury to finish third in League Two and has now steered them to fifth in the League One table. "I always imagine the impossible, it's something I live for everyday," he told BBC Radio Manchester. "You can't achieve the impossible if you don't put your work in every single minute of every day. "This group of players deserve special credit because four wins in any league is something that comes from putting in hard miles. "It's a great story to hear. We are doing something at this football club that's creating a new future."